A gum lift reconstructs your gum tissue that surrounds your teeth to reveal more of their surface. When compared to the methods used in the past, new technologies have transformed the procedure to make it quick and virtually painless. 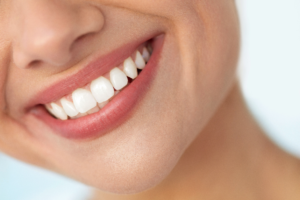 A soft tissue laser is used to cut into the gum tissue to reshape the areas that are visible when you smile. Unlike procedures of the past, there are no scalpels or sutures needed. The use of the laser also provides a faster recovery time with fewer risks. It targets the specific tissue without causing damage to the surrounding areas. In addition, it sterilizes and cauterizes as it cuts, reducing bleeding and the potential for infection. After just one appointment, you will significantly improve the symmetry and beauty of your smile. The simple in-office procedure is minimally invasive. The use of the laser makes the recovery process short and relatively pain-free. The day of your treatment, it is best to limit your activities and rest to allow your body to heal. It is important to keep the gum tissue clean. Use a warm salt rinse and a capful of hydrogen peroxide to swish in your mouth after you have eaten or gotten a drink. Your gums may be tender for a few days, but this should subside quickly. To manage your discomfort, over-the-counter pain relievers can be used. On occasion, scabbing can occur, which will fall off as the tissue heals. Do not be concerned about it changing the appearance of the treated areas. When brushing and flossing, be careful not to injure the tissue. Gently clean your teeth twice a day to avoid irritating the area. To further reduce irritation, it is best to stick to a soft diet for a few days, like eggs, pasta, and yogurt. Avoid hard or spicy foods that can get under your gums while they heal. If you are ready to love the smile that you see in the mirror, it is time to contact your dentist to see if a gum lift is right for you. Since 1981, Wehrkamp Dentistry has helped the community achieve healthy, beautiful smiles. We not only work to ensure that your teeth and gums stay healthy, but help you promote their appearance as well. Using cosmetic services, we can treat your gummy smile to restore your confidence. If you are ready to transform the appearance of your teeth, contact our office today to schedule a consultation.